A. The genesis of a thunderstorm is dependent on four factors - intense heating, moisture availability, instability in the atmosphere a trigger. Lower level atmosphere and surface of the earth should be hot. That is why thunderstorms activity is at its maximum during the summer season. Heating makes the parcel of air lighter and leads to low density of atmosphere. If there is moisture, the air becomes moist and hot, moist air is lighter than dry air and rises. As the air rises, it transfers heat from the surface of the earth to the upper levels of the atmosphere. The water vapour it contains begins to cool, releases heat, condenses and forms a cloud. The cloud eventually grows upward into areas where the temperature is below freezing and various types of ice particles can be created from freezing liquid drops. Instability in the atmosphere is explained through lapse rate, which means a change of temperature with height. However, we don’t get thunderstorms every day in the summer. Here, the 'trigger' comes into the picture, which leads the air to move up rapidly. This triggering comes when there is a weather system. It may be a trough line, or a cyclonic circulation, or a Western Disturbance as it was this time around. This triggering varies from place to place. In north India and northwest India, the trigger is mostly the Western Disturbances - weather systems which generate near the Caspian Sea/Mediterranean Sea and move eastwards across Iran, Afghanistan, Pakistan and northwest India. These disturbances also induce lower level circulations in northwest India, which act as a trigger. Their effect over northwest India becomes even more intense when they extend to relatively more southerly latitude leading to moisture incursion from the Arabian Sea. There can be moisture incursion from the Bay of Bengal as well in association with these western disturbances, if there is an anti-cyclonic circulation over the north Bay of Bengal, which helps the flow of easterly to southeasterly winds up to northwest India. Superposition of favourable upper and lower-tropospheric conditions result in generally widespread outbreaks of thunderstorm activity. In May, frequent and intense western disturbance activity affected northwest India along with the development of associated cyclonic circulation over the region. As a result, there were more frequent and more intense thunderstorm and dust storm activity over northwest India. In May, three such disturbances have passed over northwest India and all were very intense. In terms of frequency, the thunderstorm activity was higher than normal. The intensity was also high, but not record-breaking. 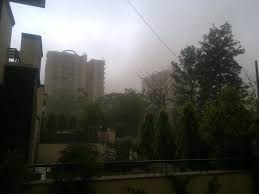 The highest wind gust over Delhi was recorded at 141 kmph (kilometre per hour) on May 10, 2006, followed by 122 kmph on May 30, 2014. This year, the highest wind gust has been 107 kmph on May 13, which is third highest since 2000. There has been usual thunderstorm activity over other parts of the country like east and northeast India and south India. Q. When do thunderstorms occur in India? Why? A. Thunderstorms occur round the year in different parts of the country. However, its frequency and intensity are maximum in summer months (March to June) as the most important factor for the occurrence of thunderstorms is the intense heating of the atmosphere at surface level. In addition to heating, the availability of moisture in lower levels over east and northeast India is also higher in April and May. In addition to heating, the availability of moisture in lower levels over east and northeast India is higher in April and May in association with an anticyclonic circulation over the Bay of Bengal, which helps moisture incursion over the region. The anti-cyclonic circulation over the Bay of Bengal causes southerly/ southwesterly winds blowing from the Bay of Bengal to these regions and hence, helps in moisture incursion in lower levels. Sometimes the easterly/southeasterly winds from this anti-cyclonic circulation over the Bay of Bengal can reach up to northwest India, if there is an active western disturbance affecting northwest India. In combination with the lower level cyclonic circulation over the northwest India due to western disturbance and the easterly/southeasterly warm and moist wind, there can be thunderstorm activity over northwest India. If the moisture is not sufficient in the region, which is the usual case over Rajasthan and adjoining areas, it leads to a dust storm. Over the south peninsula, in association with the anti-cyclonic circulation over the Bay of Bengal and also over the Arabian Sea, the westerly and easterly winds respectively blow from the Arabian Sea and the Bay of Bengal towards interior parts of the south peninsular India. As a result, the westerly and easterly winds meet each other. Hence, there is a discontinuity in wind flow. Thus, this weather phenomenon is popularly called as wind discontinuity. It results in wind convergence in lower levels and hence the upward movement resulting in thunderstorm activity. Similarly, there can be wind confluence over the central part of the country or there can be a trough of low pressure over the northern peninsula and central India leading to thunderstorms in summer months. Q. Please explain the difference between thunderstorm, squall, hailstorm and dust storm? A. Thunderstorm: A storm characteristised by the presence of in cloud electrification and associated lightning, thunder, formation of squall, strong updraft and downdraft, towering cumulonimbus associated with turbulence and icing, localised heavy rain and hailstorm. If a thunder is heard, a thunderstorm is said to have occurred. Usually, the thunder can be heard up to a distance of 40 km from the source of origin. Thunderstorms fall in the category of Meso-gamma weather systems with spatial extent of around 2~20 km and temporal scale of a few hours. Thunderstorms are hazardous and cause risk to life and public property. They are potentially hazardous for aviation sector as well in addition to transport, power, communication and other socio-economic sectors. Dust storms: The northwest India, Pakistan, and Afghanistan get convective dust storms called “aandhi” locally during the premonsoon season. During this period, the lowest atmospheric layers have very high temperature and relatively low moisture content, which makes the thunderstorms have high bases above the ground in the order of 3-4 km. As the ground remains dry over long periods, there is plenty of loose and fine dust available. 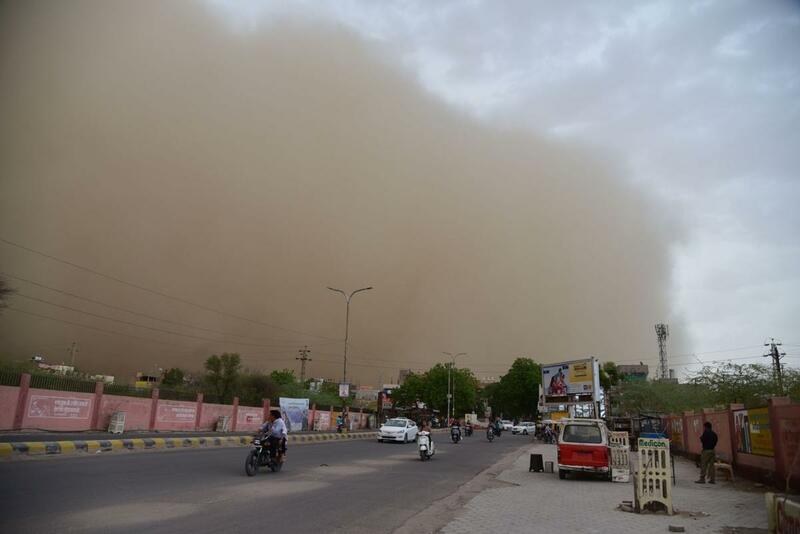 These factors enable the severe thunderstorms of northwest India to generate dust storms. They are usually brief but can drastically reduce visibility and cause property damage and injuries. Q. Which areas of India get maximum thunderstorms and hailstorms? A. Thunderstorms: The west coast of the southern peninsula, the eastern and north-eastern regions and the foothills of the Himalayas record the highest frequency of thunderstorms during the pre-monsoon months of March, April and May. Besides, thunderstorms can also occur in association with the onset of the monsoons or any other synoptic scale system. Thunderstorms over different parts of the country show some characteristic differences as well. The eastern and northeastern parts i.e Gangetic West Bengal, Jharkhand, Bihar, Odisha and Northeastern States are affected by severe thunderstorms during March to May. These storms usually travel from northwest to southeast and are called “Norwesters”. They are locally known as “Kalbaisakhi”. These storms are at times associated with “Tornadoes”. The commonly known Norwester over eastern India shows movement from the region of Chota Nagpur to Kolkata in a span of around 6 hours. Hailstorms: India is among countries which experience the highest frequency of hail in the world. There are about 29 hail days of moderate to severe intensity every year. Hail sizes comparable to mangoes, lemons, and tennis balls have been observed. About 25 per cent of total occurrence in the past recorded hailstones of 3 cm or greater diameter. India experiences hail in the winter and premonsoon seasons with virtually no events after the onset of the southwest monsoon. Past studies show that the percentage of hailstorm days out of thunderstorm days decreases from 5% to less than 2% from March to May for northeast India. Q. Do thunderstorms also cause lightning? How? A. Yes. Thunderstorms have different stages in their life cycle. In the formative stage (cumulus stage), the clouds generate and grow vertically. It is supported by a rising column of air, which is called updraft. In the matured stage, the updraft continues to feed the storm but precipitation begins to fall out of the storm, creating a downdraft, or a column of air moving downward. In this stage, the updraft and downdraft occur with almost the same speed; and this speed of air particle can be very high, sometimes reaching up to 50-60 meters per second. This strong updraft and downdraft leads to friction among the air particles. It leads to separation of charges within the cloud and hence, to the flow of current within the cloud. It is called as lightning within the cloud. This downdraft from a matured thunderstorm cloud leads to the formation of the secondary thunderstorm cloud, which again grows and gets matured leading to a lightning formation. This way, there will be a difference of electric charges between the clouds leading to cloud-to-cloud lightning. Finally, there can be a difference of charge between the base of the thunderstorm cloud and the earth surface. It leads to cloud-to-ground lightning. 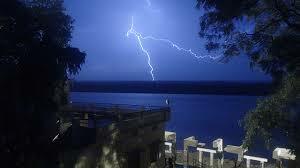 This lightning is dangerous as it leads to loss of life and property if safety measures are not taken in time. During the decay stage of the thunderstorm cloud, the downdrafts dominate over the updrafts leading to thundersqualls and strong wind in the surface, which is the cause of structural damages. With limitation in the updrafts, the frequency and intensity of lightning decreases. As lightning is the flow of electric charges, any electrically conductive body can be affected by lightning. For example, electrical appliances if operated during the lightning period. Similarly, living beings coming in contact with lightning directly or indirectly through electrical conductors can be affected, often leading to death. Q. How does IMD forecast such incidents? How precise is this forecast? A. Thunderstorm is a small-scale phenomenon and has a life cycle of up to only three hours. It has a dimension of up to 20 km to 30 km, and therefore, its detection is difficult. Automatic weather stations (AWS) provide some basic parameters such as wind speed, wind direction, temperature, pressure etc. The second tool is a satellite, but it is watching from 36,000 km height. It takes about half an hour to capture the image and another half an hour to process the data. So, by the time someone sees the satellite imagery on IMD's website, it is already one hour late. Hence, a satellite cannot capture the initiation of thunderstorm unless it is a large-scale thunder activity. The third tool is Doppler Weather Radar, which takes an observation every 10 minutes and can find out the occurrence of thunderstorms. Therefore, for better monitoring, we need a wider network of radars in the country. To forecast thunderstorms, we utilise current weather observations from our observatories, automatic weather stations, satellite observation, and radars to define what is happening where in case of thunderstorms. Any observational instrument doesn’t give a forecast. We have to develop expert tools to provide a forecast based on these observations. And, for this, some statistical software is used that go for extrapolation. But statistical software has limitations. We cannot predict occurrence and intensity of thunderstorms from numerical models well in advance. 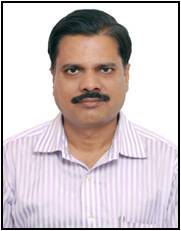 At present, we have a global model with a resolution of 12 km and a regional model with a resolution of 3 km. With these models, we can predict the area of occurrence broadly 3-5 days in advance. Apart from these two models, there are some more models of other countries — a total of 10 models — that are taken into consideration every day at 10.30 AM by the IMD. All our forecasters across the country examine and discuss the output of these models through a video conference daily from 10.30 AM to 12 noon. Based on consensus, we go for five days (120 hours) forecast. This is a general forecast issued four times in a day from our head office in Delhi and twice a day from our State offices. This forecast gives the potential area for warning and is meant for preparedness and not immediate warning. Q. How are immediate warnings issued then? A. On the day of occurrence, when we find out about certain developments, we start nowcasting. Nowcasting is valid for the next two to three hours, thus it gives only a limited lead-time. This nowcast, which is at the district level, is provided to relief commissioners, state control rooms, district collectors, disaster management units etc. This alert is specific for a district. The five-days forecast is for a meteorological subdivision. Nowcast is more specific and issued for a district with the time of occurrence, intensity, wind speed etc. Nowcasting is issued any time when we are expecting a severe weather event. Q. How are these warnings disseminated to the public? A. At present, IMD does not issue nowcasting bulletin to the general public. However, in a recent meeting, it was decided by the National Disaster Management Authority (NDMA) that as soon as IMD issues any severe weather warning, it would be flashed to the mobile phone service providers so that it reaches the maximum number of people. IMD, through its State-level offices, issues SMS-based alerts/warnings to All India Radio (AIR) stations and Doordarshan for immediate broadcast/telecast to the general public. Besides, private TV channels and FM radio also communicate weather alerts and warnings to the common man.